The secret to an efficient home can be found inside every Kemper cabinet. Our wide range of cabinet storage solutions can handle every little (and big) thing in your kitchen – and every other room in your house. Kemper has identified several “problem areas” that homeowners commonly stress over. Here are just a few examples of our creative cabinet storage solutions. 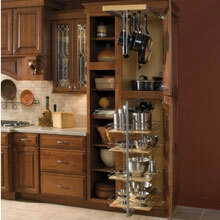 Visit our cabinet organization gallery to view options. 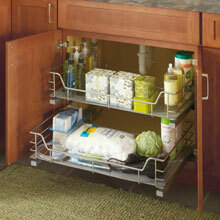 Bathroom remodeling ideas abound with our cabinet storage solutions. You'll be amazed at the features we build into our bathroom storage cabinets. 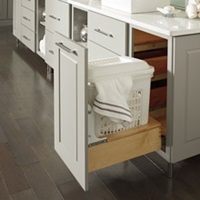 From bathroom vanities, to storage cabinets for towels and linens, to cabinets perfect for small spaces, look to MasterBrand for bathroom organization ideas. 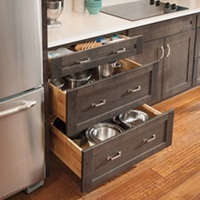 In a kitchen remodeling survey conducted by Houzz in October 2013, nearly half of respondents (48 percent) said improving kitchen organization and storage was the reason they chose to renovate. Our ingenious pantry cabinets and corner cabinets help you eliminate those cluttered pantry spaces and scary, dark corners in your kitchen. We didn't limit our remodeling ideas to just kitchens and baths. 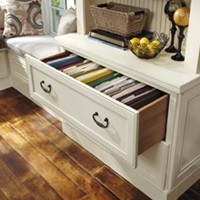 We know that office storage is integral to nearly every home. Whether your office space is an extension of the kitchen or located in a dedicated room, our cabinets can create office organization anywhere in your home. This clever cabinet keeps your whole family organized. 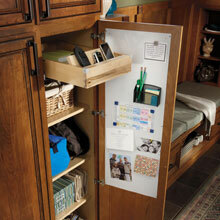 It houses a message center, charging station for mobile devices and abundant shelf space. There is always room for organization. Kemper offers an upper pullout for hanging and a lower pullout for easy lid storage all in one. Perfect for any kitchen zealot who has a large collection of pots and pans. The U-shaped design of this vanity’s chrome rollout hugs the plumbing, optimizing under-sink storage and organization for the bath.